I don’t know if you can tell — I doubt you can — but I am actually a serious student. I just didn’t do my homework in this class for three weeks. And I am pretty terrible at writing in a serious, academic manner. I swear I am working on that. However, not only am I taking steps to reduce my workload so that I can, like, get my work done, but also, I am not satisfied with the work that I have done. That…that’s what serious academics are, right? Never satisfied? I was not happy with it. At all. 1) It does, indeed, take you to Gunston Hall — but it doesn’t tell you that it’s taken you to Gunston Hall. I want there to be a little thumbtack or icon or something, that you can click on and it tells you that this random building in the middle of nowhere is Gunston Hall, which was built by/for George Mason (the Lover) and sat on a 5500-acre tobacco farm, and that we care because George Mason (the Lover) was key in creating the Bill of Rights. 2) You have to c&p the url. Maybe this is something other people have complained about. I was hoping for an embeddable map. I may take a screen shot, after I get a thumbtack on that map. 3) I put the “&output=kml” at the end of the url, but all that did was make it so that it wanted to open the link in Google Earth. When I had my boyfriend try the link with that language at the end, he couldn’t open it, because he doesn’t have Google Earth on my computer. So hmm. Going back to grab it through “My Places” gets me exactly what I want. See? I took a screencapture as proof. Not sure how I’ll figure this out. Next time, folks! Would you like to see me catch up on three weeks’ worth of blog posts? You would? Okay. Well, not all in one post. But hopefully within the next week. Presumably it’s not going to be high-quality postings, but after catching up, I should be able to focus on quality, not quantity. This made him laugh. If you type “Zoidberg” into Google Earth you get a toy shop on the Eastern Shore in Maryland. 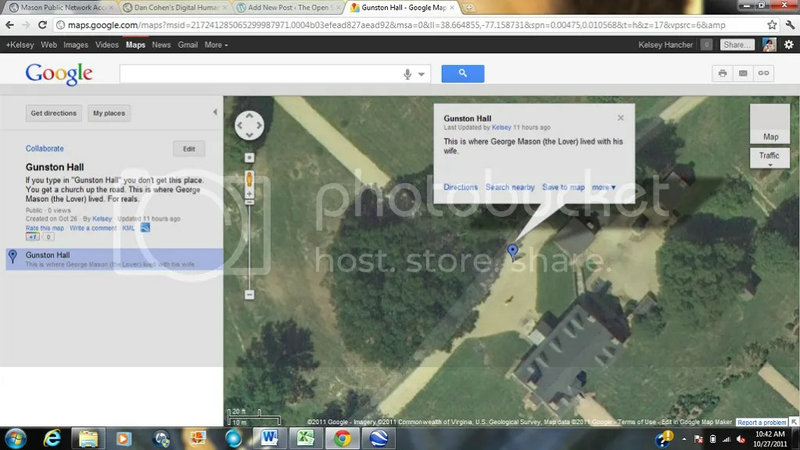 After hmming and hawing I decided to go with showing you where Gunston Hall is. Gunston Hall is the manor where George Mason (the Lover) and his wife lived. It was also a tobacco plantation. If you look for it on Google Maps, it brings you to a nearby church. Presumably more people are interested in church than in George Mason (the Lover), but that’s a topic for an entirely different blog entry. You can visit this place! Take 123 south to Route 1, go north 2.5 miles, then turn onto Gunston Road. Then drive. For a really long time. Tomorrow: Mason Neck, as it was back then. I made a costume for my boyfriend’s lizard, Slinky. Took about twenty minutes. It’s not done, though. By the end he’ll be Bulbasaur!